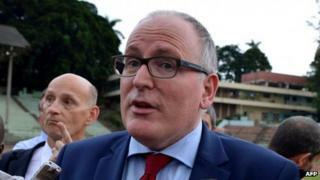 Dutch Foreign Minister Frans Timmermans has urged the European Union to take a new look at its relationship with Cuba. Mr Timmermans, who is on a visit to Cuba, said the best way to promote change on the Communist-run island was through dialogue, not isolation. The EU restricts its political ties with the Cuban government to try to encourage multi-party democracy and an end to human rights violations. He is the first Dutch foreign minister to visit since the 1959 revolution. Mr Timmermans said that the economic reforms under way on the island were "encouraging". According to Communist newspaper Juventud Rebelde, he told the Cuban Vice-President of the Council of Minister, Ricardo Cabrisas, that the economic changes were a chance to improve business and human ties between the two countries. In 1996, the EU agreed on a set of rules governing its relations with Cuba, called the Common Position. It states that the EU's objective is "to encourage a process of transition to a pluralist democracy and respect for human rights and fundamental freedoms, as well as sustainable recovery and improvement in the living standards of the Cuban people". Cuba has rejected the Common Position, arguing that it constitutes an interference in its internal affairs. Speaking during a visit to a football camp for Cuban children in Havana, Mr Timmermans said that differences of opinion between the EU and Cuba would remain. "But we have seen that not meeting each other, not talking about this doesn't really help," he said, arguing that dialogue could "bring the relationship forward". He told the BBC's Sarah Rainsford in Havana that he would raise human rights concerns with his Cuban counterpart on Tuesday "as I always do wherever I travel". He told our correspondent that he did not have "total freedom in selecting people we could see". "Cuba is changing, but not in every respect," he said, arguing that "bold steps" were needed in its economic policy as well as "more openness in society". One rights group in Cuba says more than 1,000 such detentions had been carried out in December alone. The EU is a key trading partner for Cuba and hundreds of thousands of European tourists visit the island every year.